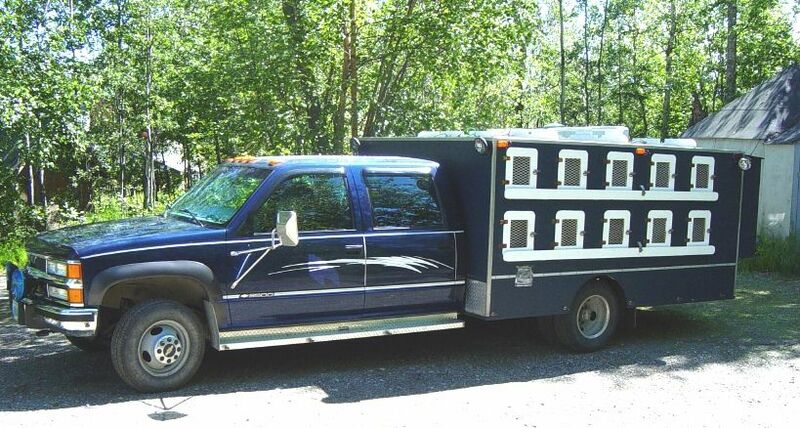 Can carry a max load of 56 dogs, but is usually riding 50. Special features: propane Heat Box capable of 70 degree temps at -40F. Very clean and efficient. 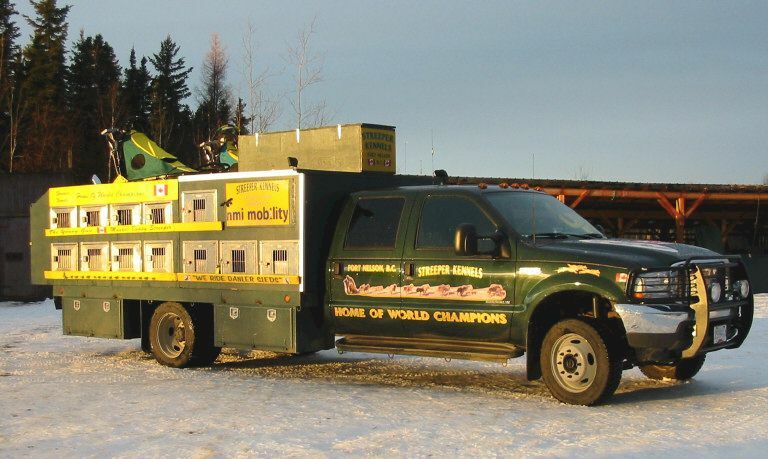 Truck holds 15 dogs, all boxes Formica laminated inside and out for easy cleaning, power vented boxes, seats five people with seat belts, sleeping room for two, propane heat, TV/VCR, inside storage for sleds. Gets 15 mpg (diesel). 3,000 watt inverter (which in power outages powers my house), microwave, 12 CD changer, Light Force driving lights and cell phone antenna, which help make the trips more pleasant and safe. 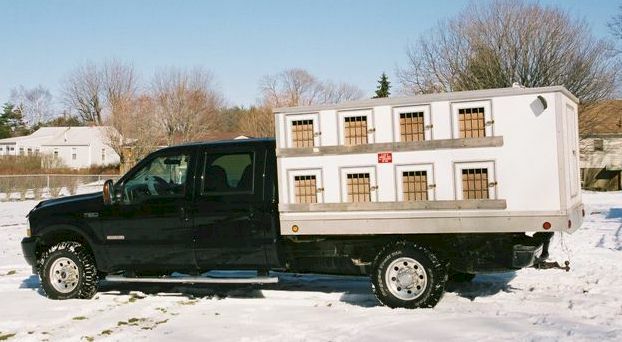 Holds 40 dogs comfortably as each box is 24" wide. 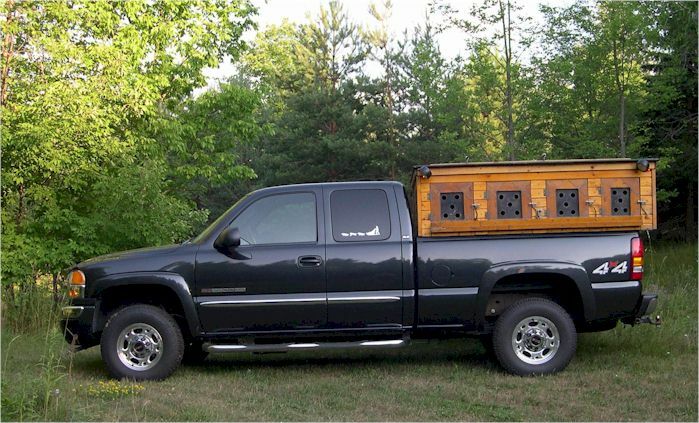 Another "luxury" is the tons of storage space for long trips. There is storage the whole center of the dog box and two compartments on the back for the necessities for each run or race. There is also a huge storage space across the back where I hang lines and can slide harnesses back and forth and helps keep the harnesses dry and separated. 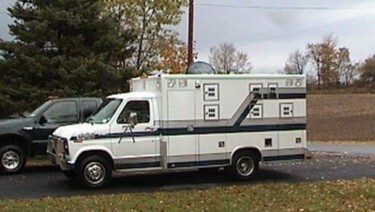 Equipped with out riggers. 18 hole all fiberglass box with cooling fans for upper and lower boxes. There is storage at back of the box for harness and bowls. The truck bed is all useable storage. Pull out trays under the box to access storage. This rustic dog box will hold 14 dogs. 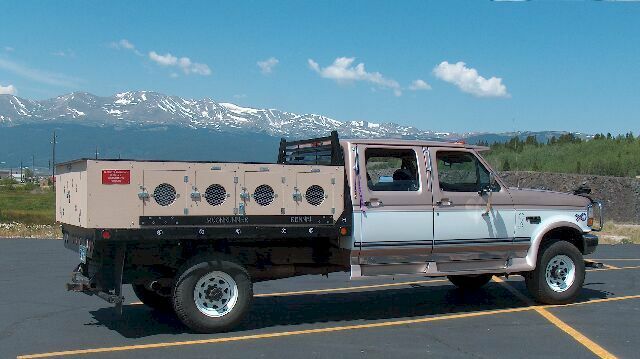 There is a storage compartment in the back & pull-out trays below, giving us plenty of room for all of our gear. Auxiliary battery in box powers flood lights & storage compartment light. Very sweet and comfortable ride. Has the new 6.0L powerstroke engine which was a must for my husband but I requested the finer things - leather heated seats and a DVD player for the long rides! The dogs ride very comfortably in spacious boxes that allow them to stretch out or ride with a buddy. 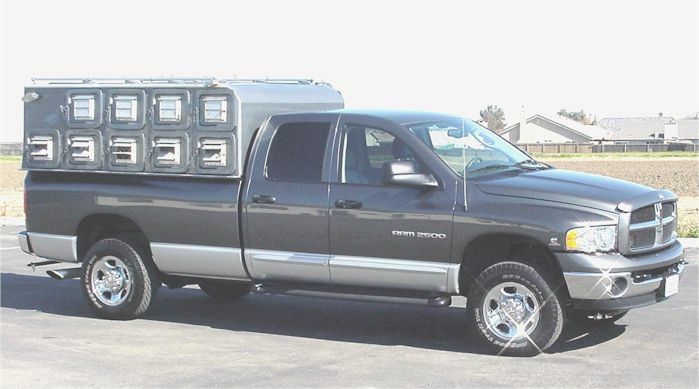 The storage compartment on the back has lights inside and out so late night drops are not a problem. The windows are equipped with channels on the inside so a wood door cover can be slid in for really bad conditions. 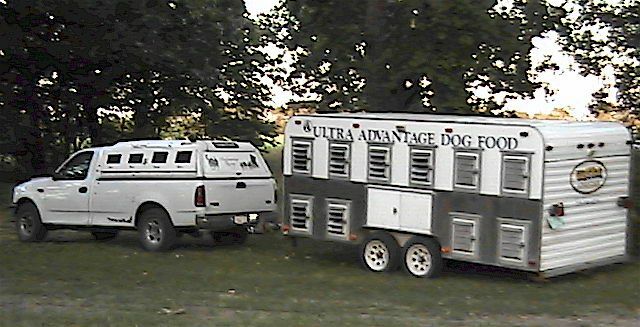 Trailer has 20 holes, can carry 2 dogs per hole.